All of the site’s departmental managers’ report into me and I report to my Divisional Director, keeping him informed of our site’s progress against its manufacturer and financial targets. I joined the motor trade in 1995 and have worked with the BMW Brand for over 20 years. I started as a sales exec and worked my way through the management structure to achieve my first Head of Business role in 2014. I’m proud to manage a site for a forward thinking group that puts their employees first and when I’m looking after return for our shareholders, I get to do this in an honest and transparent manner. I oversee the financial processing, reporting and controls in my business and support the site by providing advice and support to aid them in driving the business forward. Our site finance team also work closely with the Regional Accounting Centres and other Accountants across the group to ensure consistency and idea share. I started at a Vauxhall Dealership in July 1995 as a Purchase Ledger Clerk and progressed my way through many Accounting roles including regional roles, so have been fortunate to gain experience in working with many businesses. This year at Jardine, I successfully completed the first round of the Jardine Finance Academy which is a programme to cross-skill existing colleagues. I really enjoyed the programme and it was a great opportunity for personal development. I’m responsible for the delivery of exceptional customer service through the on-site workshop and service teams, which I lead. When I look to my teams, I expect individuals to want to make a difference. My expectation is for them to want to positively impact a customer’s experience and also think about how they can make a colleague’s day just a little bit easier too. 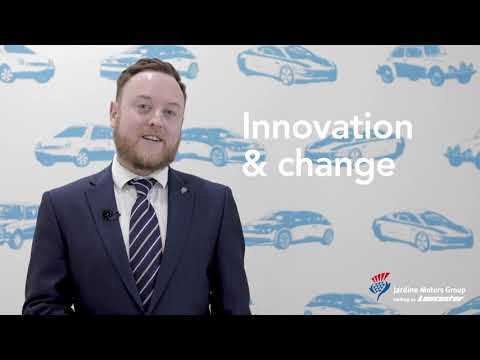 Having worked in Aftersales Management for many years, for other motor retailers before JMG, the unique offering that I feel JMG have is the opportunity to work with a team of exceptional people within a worldwide organisation. When it comes to my site specifically, it’s awesome working at JLR MK… it’s like coming to work each day in a 5* hotel for cars! Our Aftersales Managers look after all functions within this business area, with Service and Parts Managers looking after their specialised areas, including team management and development. Depending on site-size, these roles can vary in terms of reporting lines and team sizes. Our Workshop Managers and Supervisors manage qualified workshop teams and their apprentices. In larger sites, these individuals also look after zone supervisors, utilising their technical knowledge to ensure that vehicles are maintained to the highest possible standard efficiently. Our on-site Accounts Management look after all site finances including the monthly MI and advising their senior site stakeholders on budgetary decisions. Our Senior Accountants manage at least 2 sites and mentor further Accountants within their brand's division. Our Corporate Sales Managers look after and give direction to a team of Local Business Development Managers specialising in specific brands from our portfolio.